We think about our cleaning routines, but what if you have habits that are keeping you from the house you love? 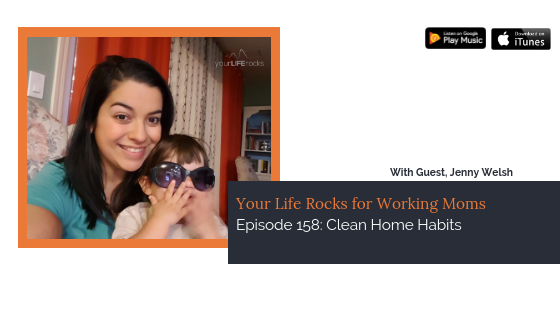 In this episode, we are speaking with author Jenny Welsh about how to create a home you love and build habits that make it possible while breaking habits that are getting in your way. After 6 years as a working mom, Jenny Welsh took a leap of faith and became a stay at home mom after her third child was born. Now, she helps moms organize their homes and schedules, so they can do more of what they love. Get started today with her 30 Days of Decluttering Challenge available for free at www.homeafterthree.com. I want women to know that creating a home that they love is completely possible. It isn’t a fantasy reserved for Pinterest. But, it’s something that can be achieved by anyone. It is not dictated by finances or schedule constraints. That’s because creating a home you love is more about feeling content than it is about how much or what kind of stuff fills your home. PRAY Start with prayer. Before you embark on a decluttering purge of your home, pray for contentment, clarity and intention. God wants us to live full and abundant lives and He will mold our hearts, so that we can fully appreciate his blessings when we ask him. REMOVE CLUTTER AND EXCESS If the thought of decluttering is challenging for you, shift your mindset. Instead of focusing on what you are removing from your home, focus on what you are creating space for. It helps to think about the purpose of your possessions. What purpose do you want your home to serve? What about each room? Each item in each room? Once you have an intentionally defined purpose for your home, identifying which items to discard becomes clearer. When you have completely removed clutter your home will enhance the things you and your family enjoy doing rather than distract from them. This shift in mindset, will make creating cleaning habits easier and more natural. CREATE CLEANING HABITS Appreciate and care for your items at home. This means cleaning throughout the day and not letting things “pile up.” Create a cleaning schedule for yourself based on how much time you have, your personal preferences (are your more productive in the mornings or evenings?) and ages of your children (how much can they help?). Even 15 minutes a day makes a noticeable difference. By modeling cleaning habits like putting away shoes when we take them off after a long day or cleaning our dishes and putting them away after a meal, we are teaching our children good cleaning habits as well. It won’t be long before the entire family is contributing to keeping a clean home. Jenny Welsh of Home After Three.